The James Hutton Institute brings together the Macaulay Land Use Research Institute (MLURI) and SCRI (Scottish Crop Research Institute), both of which have illustrious histories. The new institute was created on 1 April 2011. 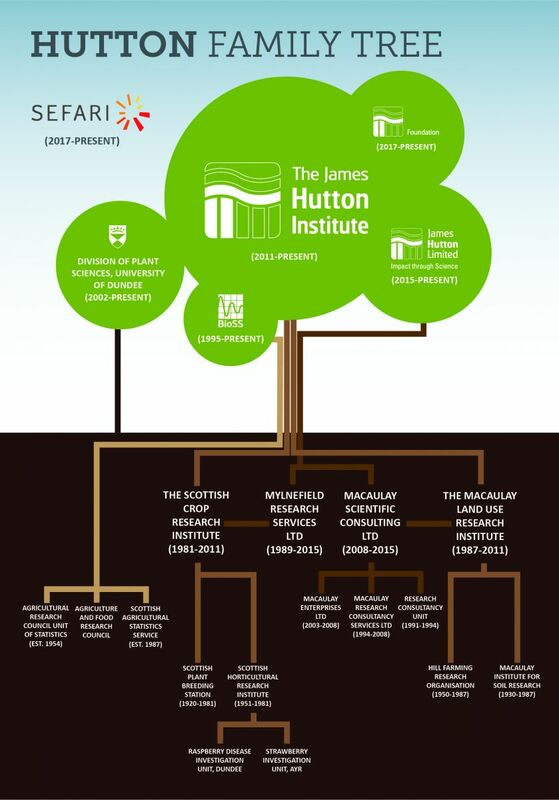 See a 'family tree' of the James Hutton Institute in the illustration to the right. The Macaulay Institute for Soil Research was founded in 1930 through a benefaction from one of Canada's Scottish sons, Dr T.B. Macaulay (1860 - 1942), of the Sun Life Assurance Company of Canada. His aim was to improve the productivity of Scottish agriculture. Dr Macaulay was a descendant of the Macaulays from the Outer Hebridean Isle of Lewis, Scotland. He was true to his Hebridean roots throughout his life, often giving large donations to Lewis, which funded various projects including a new library and a new wing at Lewis hospital. In April 1987 the Macaulay Institute for Soil Research merged with the Hill Farming Research Organisation and became the Macaulay Land Use Research Institute. MLURI was established to carry out research in support of the agricultural industry, taking account of the interaction between the industry and other land users, and set in the context of the environmental objectives of the UK Government and the European Union. SCRI was created in 1981 with the amalgamation of the long-established Scottish Plant Breeding Station based in Pentlandfield, Edinburgh, and the Scottish Horticultural Research Institute in Invergowrie, Dundee. It was in 1921 that the Scottish Plant Breeding Station (SPBS) was set up; at the same time as several other research stations, in response to recognition by farmers, landowners and the government that UK agricultural productivity and efficiency had fallen behind that of the rest of Europe and the world. Some 30 years later the Scottish Horticultural Research Institute (SHRI) was established at the site of the former Mylnefield Farm on the western fringes of Dundee with the aim of undertaking organised research into the problems of horticultural production in Scotland. As a world-leading centre of crop research and breeding a wide variety of crops have come under its gaze including brassicas, lilies and grasses but latterly focussed mainly on soft fruit, potatoes and barley. Research has also been conducted into pests and diseases, sustainability, the impacts of climate change, biodiversity and high quality and healthy food. In addition to its research remit, the Institute administers the Scottish Society for Crop Research , providing a link between farmers, processors and other interested individuals and its research. In 1987 the Institute assumed managerial responsibility for Biomathematics and Statistics Scotland (BioSS) , formerly the Scottish Agricultural Statistics Service. In 1989, SCRI established a commercial company, Mylnefield Research Services (MRS) Ltd, to market products, intellectual property and the expertise of both SCRI and MRS Ltd scientists. MRS merged with Macaulay Scientific Consulting to form James Hutton Limited , which started trading on 1 April 2015. We have collated some of the Annual reviews and reports from legacy organisations (1924-2010) and made these available .